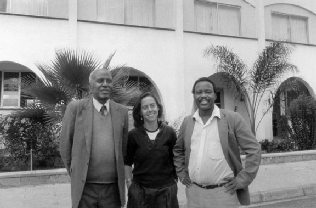 Photo: Mimi Edmunds with Kenyan members of parliament Charles Murgor and Joseph Chemjor, about 1967. The MPs were among the elders who termed Mimi and her sister Dorsett "daughters of the Rift." Photo by Dorsett Edmunds. I had to go to Africa to understand America. Sitting in Sproul Hall Plaza on the University of California's Berkeley campus, arm in arm with someone I don't know, I'm just a little nervous. It's October 1, 1964, and I'm in my first year at Berkeley, having just transferred from a small women's college on the East Coast. Suddenly we hear a hundred or so motorcycles roaring down Bancroft Avenue. I had never been in a demonstration. I hadn't gone on the Freedom Rides in the South, and in fact I hadn't yet voted. I didn't really understand why the United States was in Vietnam. But I had learned something about segregation and discrimination growing up in rural Maryland. Other Berkeley students had just returned from working with SNCC and CORE during the Freedom Summer of 1964. They included Jack Weinberg and Mario Savio, graduate students who had been registering black voters in Mississippi. They were fired up to right the injustices they had seen, and they began recruiting students for a variety of causes on and off campus. Their activities included picketing the Oakland Tribune for discrimination. University president Clark Kerr and the University of California Board of Regents capitulated to pressure from the newspaper's owner and publisher, William Knowland, and outlawed all political activity on campus. Savio and Weinberg wasted no time in challenging the new prohibition. Jack Weinberg sat down at his now-unauthorized recruitment table. He was arrested and put in a police car. Mario Savio climbed up on top of the police car and called for us all to sit down in the name of the right to practice free speech. As we blocked the police car from moving, we could see the phalanx of shiny police motorcycles at the university gates, waiting and watching. We continued to sit as night came on. We didn't know it then, but we were participants in the birth of the free speech movement, one of the many expressions of the movement that would define a decade and, to an extent, a generation. The movement of the 1960s embraced not only civil rights activism but also anti--Vietnam War protest, along with efforts to counter cultural complacency with "free love, drugs, and rock 'n' roll." Some of us were radically secular; others had strong religious connections. The sit-ins that began in the South in 1960 helped make the civil rights movement a moral center of political action in the United States for much of the decade. In the South, in particular, the term "movement" had a spiritual dimension. The church was a meeting place and a safe haven; prayer, preaching, and song lent courage and inspiration. "Movement" also meant moving ahead and together, the opposite of retreat, fragmentation, and passive acceptance of the status quo. "One isolated battle had given way to many scattered ones," writes the historian Taylor Branch. "Now in the Mississippi jails [the Freedom Riders] were moving from similar experiences to a common experience. Students began to think of the movement as a vocation in itself " (1988, 485). I am going to explore the significance of the 1960s by telling the stories of four people--Mary Jane Patterson, Bernard (Ben) Makhosezwe Magubane, Prexy Nesbitt, Mia Adjali--and a bit of my own story. As a group we are black and white, women and men, born in the United States and in Africa. We represent more than one generation of activists, both through our own experience and through the work and influence of our families. We are not so much typical as illustrative of the wide diversity of people who were fortunate enough to be engaged during this tumultuous decade. What we have in common, and what sets us apart from most activists involved in the movement, is our connection to the new Africa that was emerging in the 1960s. The bond that was created then continues today. We also shared, by the end of the decade, understandings about the world we lived in: that the United States was an imperialist power, and that, for U.S. policy makers, Cold War imperatives trumped verbal commitments to freedom in Africa. Africa was a beacon of hope in the decade: 28 countries gained political independence, 17 in 1960 alone. In the United States, historic civil rights legislation was passed, and entrenched systems of racial discrimination were actively challenged as never before. There was a sense of freedom rising. At the same time, Washington's preoccupation with the Cold War led to policies that contributed to conflict and instability in Africa--in the Congo, in the Portuguese colonies, and in the white settler states of Rhodesia, South Africa, and South West Africa. By decade's end it was clear that the U.S. government was trying to limit the scope of independence in Africa as well as the pace and extent of change in the United States itself. Those of us active in the decade wrestled with these realities. We made decisions to be engaged in struggles for justice, many of us leaving home to do so. A year after the demonstration in Sproul Hall Plaza, the alienation I felt about the war in Vietnam and the injustices in my society made me want to live and work in a non-Western culture. I was one of many young idealists who went away to better understand my home country and to do something that I thought might contribute to a better world. I received an invitation from the Peace Corps to teach secondary school in Kenya. What I didn't know was that my twin sister Dorsett had applied the very same day, and the Peace Corps, thinking we were the same person, sent her an invitation to Kenya as well. In the end, we both went. I was posted to a young secondary school, Chepterit, on the western slope of the Great Rift Valley near the Ugandan border, 200 miles from Nairobi. Dorsett went to a Harambee school 60 miles north, also high up on the western escarpment of the Rift. For two years I taught high school girls at Chepterit and boys in the neighboring boys' school six miles south on a dirt road, preparing them for higher studies or the workforce. None of them wanted to go back to the farm. It was a poor province, but the students were driven to get an education, and while many of them may have lacked a pair of shoes, their writing and reading skills were better than my kid brother's back in the States. It was difficult to keep books in our small library. The Autobiography of Malcolm X regularly went missing. I was struck by how little of their own country's history these students knew, and by how well they could recite British monarchical and constitutional history. Even three or four years after independence, the students were not learning Kenyan history. I decided to create a branch of the East African History Society in my local district. During school breaks I worked in health programs, inoculating hundreds of people against infectious diseases, especially in the Maasai Mara region. Because Dorsett and I were posted to neighboring districts, we probably got to know twice as many people in the province as we might have otherwise. Many of my students were cousins of her students. The local elders decided that since our parents had allowed their twin daughters both to come, they needed to adopt us as "daughters of the Rift," and so they did. And so we were, and are. Chapter continues on pages 85-97 Order book.